As we celebrate Star Treks 50th anniversary today I want to take you back in gaming 25, well actually 24, years ago to celebrate a milestone in video gaming, and Star Trek games. So as you drink you Romulan Ale tonight to toast these 50 big years, remember these great games as part of the legacy. With my pockets thick from 8th grade graduation money, I went out shopping the weekend after my party with the clear goal of at least picking up a new Game Boy game. I had been eyeing Star Trek 25th Anniversary for a while at that point, especially since it was normally out of my weekly allowance price range, and I was determined I was going to buy it that day. I can remember buying it as clear as anything, and even have some great memories from moments when I was playing it that summer. For instance I can remember playing it when the Chicago Bulls beat the Portland Trailblazers taking the 1992 NBA championship. I can also remember a napkin I had (think I still might have it) that I wrote all the level codes down on till I eventually beat the game. To be honest I’m glad I set out to beat it that summer as a 12/13 year old, because the game is murder on the eyes and I can remember the headaches it gave me back then, so I have no idea how I would get through it now. Your probably saying “Wait did he just say 1992, but wasn’t 1991 the 25th anniversary of Star Trek?”. 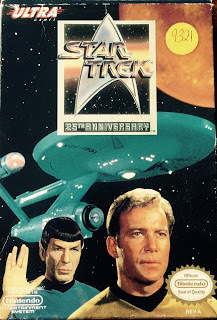 Well, yes and yes, even though 1991 was Star Treks 25th anniversary it wouldn’t be til 1992 that Star Trek 25th Anniversary would be released as a video game. It would first be released as an NES and Game Boy title in February of 1992, but a PC version would follow in April of 1992. Essentially the game was to be released in all formats by Christmas of 1991, however delays occurred with all three due to licensing issues, especially with the much more detailed PC version. Both the NES and Game Boy versions would go on to become critically acclaimed, but it was the PC version that really broke the mold for both PC and Star Trek games to follow. The PC version not only looked good, had an engaging story line, and played well, but also featured the voice talent of the original cast. Up until this point most PC games hadn’t been that detailed, or looked and played well but had terrible voice acting, or had excellent voice acting but lacked story and/or graphics. This game not only had all the great elements of a well produced game, but gave die hard Star Trek fans the element of actual cast members reprising their roles for a video game. To say the least the game quickly gained critical acclaim, and became a tremendous hit with gamers and Star Trek fans alike. 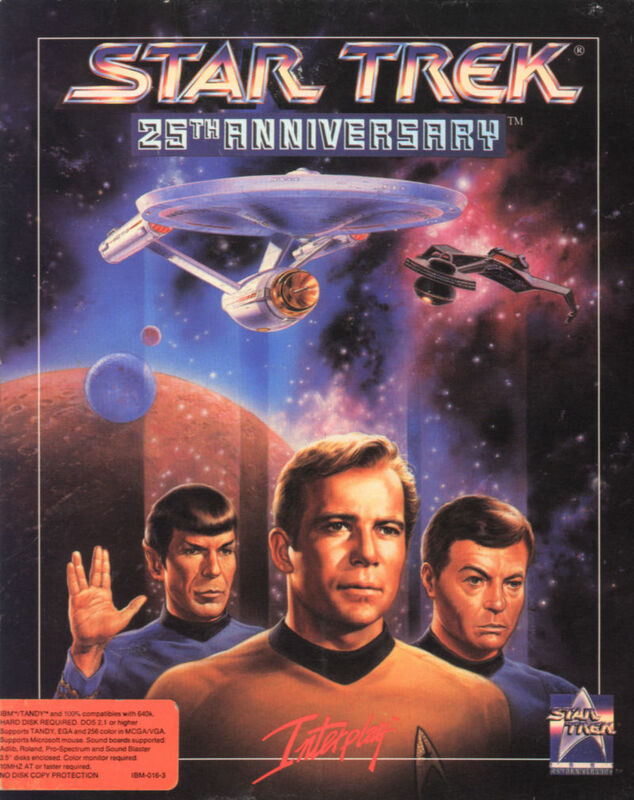 Till this day it still takes its place in many top ten list as being among the best Star Trek video game titles of all time. The game would inspire a sequel Star Trek: Judgement Rites released in 1993, but the game didn’t prove as successful as it’s predecessor and was ultimately a commercial failure. I will be talking about Judgement Rites– Collectors Edition in a future post. The NES and Game Boy versions also reviewed well, but never achieved the longevity of their PC cousin. Part of this might be because although the games where great original titles, they could be hard to play or in the case of the Game Boy version even hard on the eyes. Of course when it came to both the NES and Game Boy versions it was unusual for console versions to precede the PC version. At that point console versions usually came after the PC versions as downgraded ports meant to utilize the slower processing power, and limited memory capabilities of consoles. Essentially in this case the PC version almost came as an upgrade of the console versions. So let’s talk about the games themselves. As I said all three of the games I mentioned here are actually quite good, yet at the same time they are somehow each very unique, despite the title. 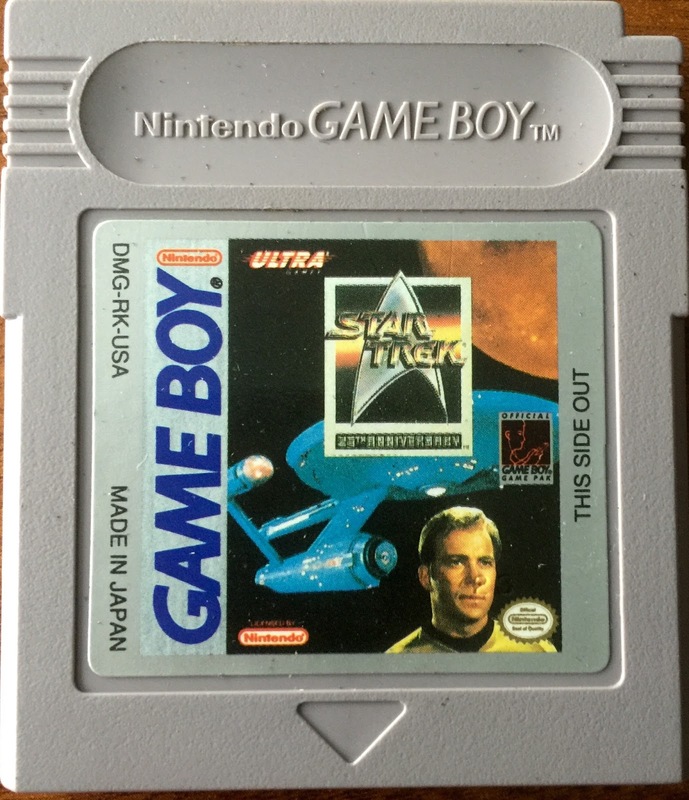 The Game Boy version like that of the NES, is heavily inspired by actual episodes of the The Original Series which I will refer to as TOS. In this case the Game Boy version takes a lot of its inspiration from the TOS episode The Doomsday Machine and in this game the crew of the Enterprise must roam from planet to planet collecting pieces of a proto-matter disruptor, a weapon capable of stopping the “Doomsday Machine”, but that was stolen from the Federation by the Klingons and dismantled and hidden on these planets. Basically the game jumps between being a SHMUP where the Enterprise fights its way through space in a slow moving H-scrolling manner, shooting up asteroids, and space amoebas, as well as Klingons and Romulans, to a an overhead RPG in which you play Captain Kirk fighting planet-side to seek out the missing pieces of the proto-matter disruptor. Like any game of its era it can be frustrating to play at times, and as I said on the Game Boy its a bit hard on the eyes. Of course you could always plug it into a Super Game Boy, Retron 5, or backlight GBA to play or even emulate it. In addition to this it also has a fairly easy password system, as I mentioned with the pass-code napkin above, which works as well as a modern save state. Overall its a pretty good game, and if you have the patience its worth checking out and playing. The NES version is a good looking game and makes it easy to see how it’s related to the PC version. It’s also very detailed, which tells me someone at Ultra really cared about making this one. Like I said with the Game Boy version this one is also heavily inspired by the TOS episodes The Apple, and A Piece of the Action as well as a few others. The basic premise of this one is that the Enterprise is caught in space time tear that continually drains its Dilithium crystals, and the crew must go planet to planet collecting new crystals while trying to solve the mystery of the space-time tear they are caught it. The game has some beautiful on-bridge animations which are mostly for dialog sake, until later in the game when the view screen is used for space combat, similar to the space combat in the PC version. With that said though the game is mostly spent in overhead RPG like away missions, which can be tricky to play, but still look good and are a lot of fun albeit frustrating at times. Obviously, being on the NES eye strain isn’t an issue, and as I said art wise its very well done. My only major complaint is that it could’ve used some help in the control department, which was grid like and hard to use. 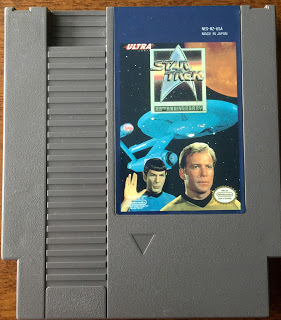 As a Trek fan and NES collector the game fits well in both collections, and I have enjoyed playing it. As previously mentioned this version is by far the best, as both a PC game and Star Trek game. The art direction, voice acting, and story line are above par compared to many other games on the PC of that era. Unlike the Game Boy and NES ports, the story line for the PC version is completely unique and doesn’t rely on old TOS episodes for backstory. Essentially, this game is broken into seven different, and non-related episodes similar to the series itself and utilizing the original casts voice talent. I was actually hoping to get some game footage playing this game myself, by my recording options on Windows aren’t working to well today. What I can say it’s an excellent title, and looks absolutely great graphically, in in game play, and just overall. To me what makes it work are the colors, its actually a very vibrant game and believe or not that kind of makes you want to play the game more. The biggest issue with the game itself is that its an old school “point n’ click”, which I was never into back in the day, but due to the fact that its a Star Trek game, I’m more than willing to move past that and actually enjoy the game. I said it a few times already and I will say it again, the voice talent of the actual cast is what makes this game what it is. Its wonderful to hear all the original casts voices, in something as minor as a video game, and for back then you have to realize how huge it was to get all of them to voice their characters just for a game. I will admit that I was stuck for a while at that stupid door in the cave in Demon World but I can thank YouTube for help with that. Come to think of it if I had recorded anything it would have been a mess due to how I am playing 25th Anniversary (PC). I’m actually playing it on GoG, and believe it or not I picked this up on sale for $.99 about three months ago. The only issue is, and this is common with many of these old DOS games, that you needed the manual, key command sheet, or even keyboard overlay to play them since the mouse only controls limited things. In addition to that you also need a star chart to tell you where everything is because the in games star chart doesn’t list the name of the system you click on, and trust me I’ve mis-clicked on a few, and it wouldn’t have been good YouTube watching. Of course buying on GoG over Steam (and part of the reason I regret buy Starfleet Academy from Steam instead of GoG now) is that GoG provides you with the extras you need to survive a DOS game, like printable keyboard command sheets, manuals, and whatever else you need to play, and now I have to go back and print out the star map from them later. 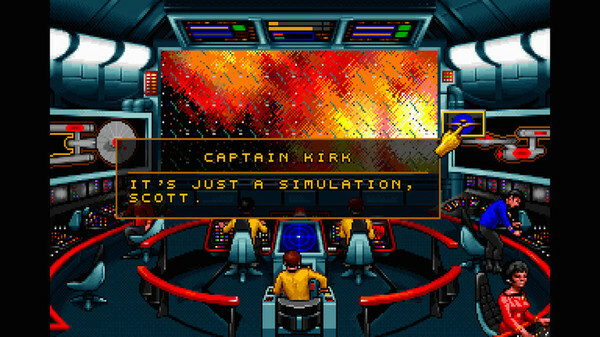 I have to agree with a lot of the game critics who place this one among the top ten Star Trek games of all time, because it does in fact live up to the hype and really feel like your participating in an old TOS episode. It looks, sounds, and is just written beautifully.